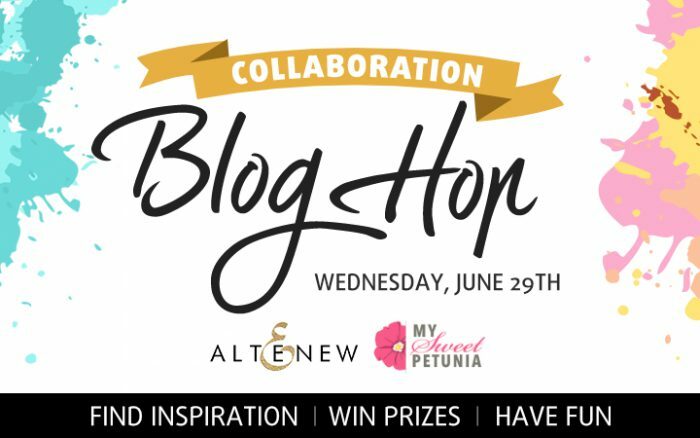 Hello everyone and thank you so much for stopping by today to celebrate Altenew & My Sweet Petunia Blog Hop (more on that below). As I sat down to create a card I’m featuring in this post I struggled with the perfect color combination. And this is something I often find difficult when I create cards. I have a few go-to color combos that I use often and consider to be my favorite, but when I come across new colors I often become puzzled as I have no clue how to combine them to have beautiful color combinations on my cards. A few years ago when I stepped away from scrapbooking and started doing a lot more Clean & Simple cardmaking I created a Color Guide for myself to use; I still use it almost every time I make a card. I believe I’ve mentioned it briefly in one of my videos a few years ago, but I wanted dedicate a separate post to it as I really find it to be a very helpful tool especially when it comes to stamping. So hopefully, if you are also struggling with selecting colors for your handmade cards you’ll also find this useful. I’ve had a few people ask me how to make collages with 4 color palettes (instead of one) to print. I made mine in Adobe Photoshop and printed from Photoshop. But there are a lot of free online apps that can be used to create similar collages. I’ve filmed a quick screen capture video to show you how you can make a collage in this app (I just googled “create collage online” and this was the first one I found, but there are many others out there). I hope this will be helpful to those of you struggling with printing several images onto one sheet. It is actually very easy to make a color combo chart like I have here. Go to Pinterest and search for Color Palette. The search will return a huge amount of various beautiful images along with color combinations pulled from those images. Its usually the image itself that I look at first, rather than the actual colors. If I find the image inspiring and if I think the colors shown there are colors I can see myself using on a card, I save the image onto a folder on my computer. Once I have a decent amount of images saved I go ahead and print them. I use photo paper rather than regular printer paper to print these so that I get true vibrant colors and so that the paper is a little bit more durable. I use the cheapest matte photo paper available as I don’t think you need to spend a lot of money on high quality photo paper to print these, the cheapest option works for me. I printed and trimmed mine to be 6×6 inches as this is a nice size for my desk. Usually anything bigger is a bit too overwhelming for me and takes too much room, so this size works for me. But you can print these in whatever size works best for you. You can also cut these up and put on a book ring so all images stay together or in a file storage system. I keep mine loose on a pile, this way I can easily and quickly flip thought my collection. 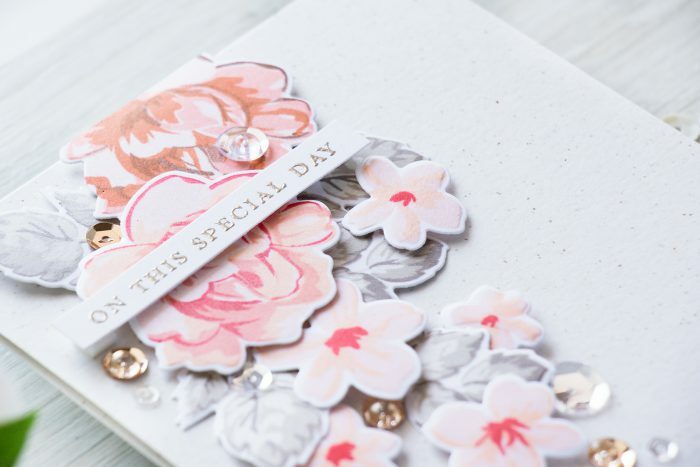 For the card I’m sharing today I was inspired by Peach and Gray color combo. I don’t think I’ve ever used it before, so it was definitely a fun one to try. I added a hint of Rose Gold by using Rose Gold sequins from Pretty Pink Posh and I think that helped to warm the card a bit as otherwise it was rather cold. I used Altenew’s Vintage Flowers stamps with matching dies to stamp and die cut the flowers and the leaves. MISTI ended up being very helpful in terms of aligning images and spending less time stamping these. I used the following colors on ink from Altenew (all linked below): Blush, Peach Perfect, Rouge, Crimson, Paper Bag, Dark Chocolate. 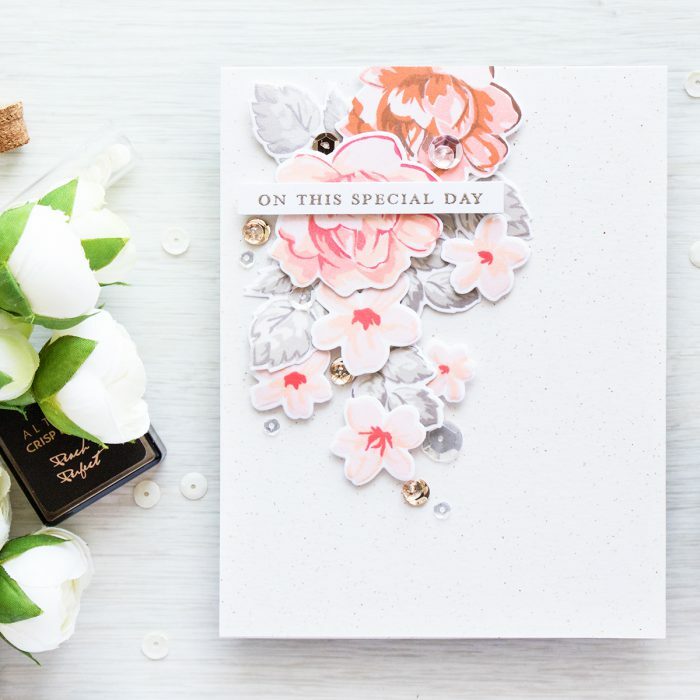 To create the sentiment I heat embossed “On This Special Day” using Platinum embossing powder from Hero Arts, the sentiment is from Thinking of You set. If you arrived from Ilina Crouse – you are on the right track as I am the last stop on this hop. You can also start at the beginning at Altenew blog. Enjoyed your video and lovely card that resulted! DELIGHTFUL card – LOVE IT ALL!!! Your card is lovely! I like your idea of printing your color inspiration piece. I’ve been going through Design Seeds looking for the perfect color combinations. I may need to print them out! Love the design and colors in your card! I am do inspired to try this! Love the use of the MISTI for aligning everything and love the layering! Thank you! 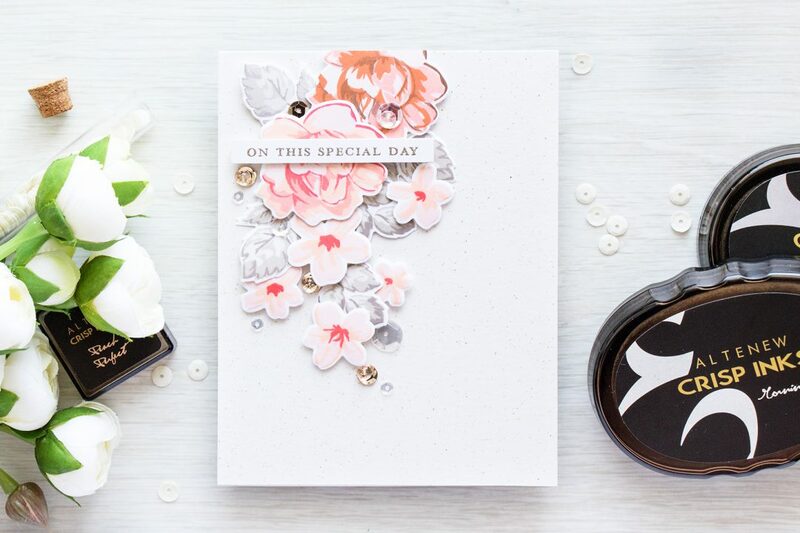 What a lovely color combo for your gorgeous card! I love your color combination – thanks for sharing. I really love that color combo. GORGEOUS! Thanks for the inspiration and tips you used to create this card. gorgeous use of colours. thank you soo much for hints re colour combination. as ever your work is inspirational and aspirational as well as inspirational. I always enjoy the colors you use on your cards! 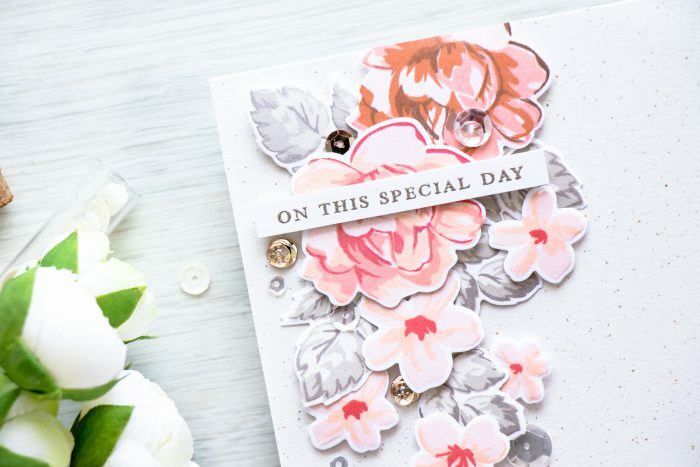 I love the layers and this card is so delicate; love the vintage flowers and the colouring. So so pretty!! Love the colors and those rose gold sequins!!! Amazing card and thanks for the chance to win. That is a nice color combo and a beautiful card! Thanks for sharing your color combo cards. I agree they are a tool. I use a color wheel fairly often. Whatever helps you on your way. Another gorgeous card! Thanks for the video on choosing color combos, too! Gorgeous card and a great color combo. That is a hard thing and I really appreciate your sharing the video on how to do this. Very helpful. Your card is beautiful as most of your cards are. Your video is very helpful, thanks. thanks for the color chart. your card is beautiful, as always! Yana, I really enjoy your videos, I often have problems with the color pallets as well. I never even thought of Pintrest to get that information so thank you for that. 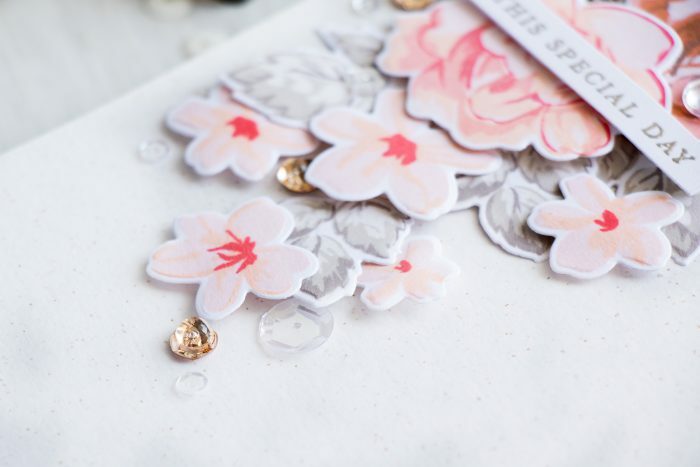 Absolutely loved your wedding card that you made for this blog.. Thank you so much. Hope you have a great week end. And a safe one. Such a great idea, I can’t wait to watch your video! Excellent work and color combination dear. 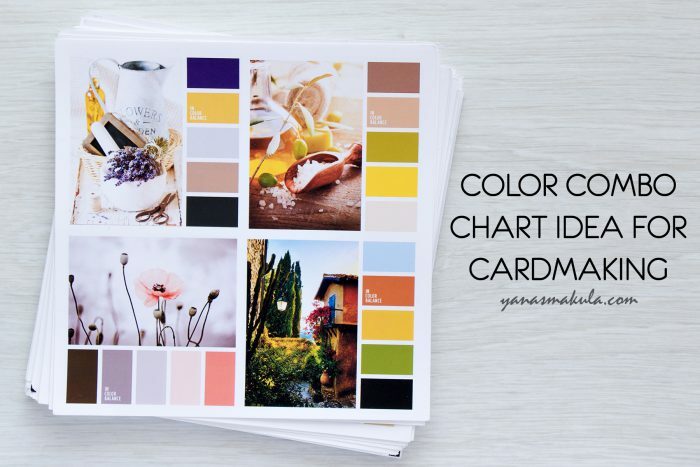 What a great idea…I have my copic color chart, a color wheel, and several other charts, but really have never considered putting the color combinations on a specific chart. Thanks for sharing, I find that color selection really is challenging and time consuming. Thanks! Not sure how I missed your videos on color palettes previously. So glad I got to see it. Good idea on assembly a chart of the color layering as well, since layering often results in a slightly different color than how the inks appear individually. Great inspiration as always. How generous of you to share you color palette idea. Love you work. Amazing card. Thank you for sharing color combinations. Very important tips. Thank you very much.